Listen to the music: From the classical canon to synthesized tones to the folk music traditions of the world, the Herb Alpert School of Music is alive with sound. Performers, composers, teachers and scholars collaborate in innovative ways, including an intercultural improvisation ensemble. 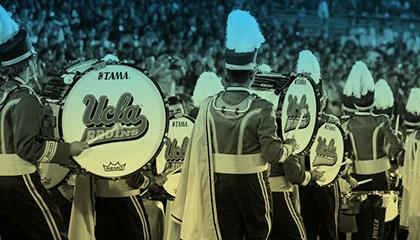 Keep our Bruin pride strong by supporting the Solid Gold Sound of the UCLA Bruin Marching Band. Provide support to the Department of Ethnomusicology to help it address its most pressing needs--from scholarships to care for the world instrument collection. Give to the Department of Music to help provide scholarships, performance workshops, concerts and support for student and faculty initiatives in all areas of music: performance, composition and music education. Give to the Department of Musicology and support faculty and student initiatives in the classroom and on the page. Be a part of our Choral Program and help support our students’ performance tours and community outreach efforts. Support and advance the study of string instruments at UCLA by funding performances, master classes, chamber ensembles, workshops and more. 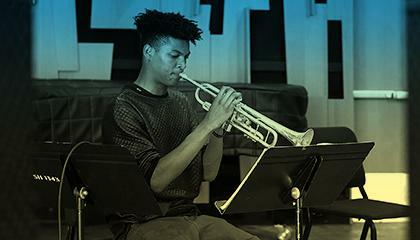 Support our new Global Jazz Studies program providing resources for young jazz musicians and scholars. Contribute to our new program in Iranian music, which includes ensembles, seminars, and performances. Support the study and preservation of music that reflects the scope of the American Jewish experience: vaudeville to opera, folk to symphonic. Provide support for instruction and initiatives designed to engage UCLA students campus-wide in the captivating world of the music industry.